Description of Fastro, main charatheristics, the emigration. The closest cities are Feltre (15 km), Bassano del Grappa (35 km), Belluno (45 km) and Trento (70 km). 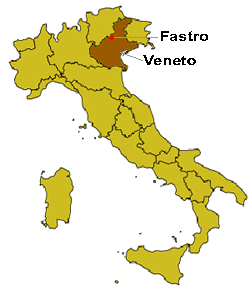 Fastro is a little village, made by four zones: Canal, Solivo, Pustertno and Bassanese. The whys the territory is divided into two districts have to be researched into historical reasons. The village is 345 m upon sea level and develops into a valley that joins Valsugana to the zone of Feltre. The zone of Canal is on the valley, whilst the others are on the sides of the mountains. The economy has not particular resources. Long ago people lived with the products their landsoils gave them and by breeding the cattle in the fields of the valleys or on the mountains around the villages. Today, most people work outsides the villages. Whilst long time ago the slopes were completely cultivated, most of them with grapes or potatoes, peas, wheet. Today most fields are abandoned and the forest is taking up the territory. The agricolture is most for domestic uses. The only forms of tourism are those ones related to the descendants of the villages that come back for spending their holidays on their original lands. At the moment Fastro has some 500 inhabitants, most of them surnamed Dall'Agnol. The second greates family is called Brandalise. There alre also some families called Grando, Battistel, Saccaro, Dalle Mulle and so on. Fastro and the lands around the city of Feltre have been places where the emigrants left from, because of the hard territory conditions, that is mostly mountainous that did not allow to satisfy all the needs of the family. At that time the only survival source was the agricolture, but because of the soil conditions, the division of the lands among the sons, and the severe climate, were the reasons of the poor resources to feed the families. The most important happening about emigration is towards Brasil. In 1876 Don Munari, the priest of Fastro, left with 275 people, among them there were 11 families, to go to the new world. The emigration went on also the during the following years towards the available places (Argentina, United States, Canada, France, Belgium, Turin, Milan, ...). The emigration is on also today, as most people are leaving in the morning and come back in the evening! One of the charatheristics of this little town is made by the old houses with a particular structure of the houses. They are high and thin, so they can exploit the light and the warmth of the sun. Every house has a wide wooden balcony where products like wheet and tobacco were dried. Other important things are the springs, used for having water and for cleaning. Every zone have more than one "capitelli" for showing the strong religious faith of the inhabitants.